Dr. Gallus and Dr. Douglas talk about scar treatment. A must see for anyone wanting to improve the appearance of a scar after injury or surgery. Hi, I’m Dr. Katerina Gallus with Restore SD Plastic Surgery, and I’m joined by my partner… Dr. Trent Douglas. To talk to you about scar healing. Once you have a scar, you will always have a scar. Scar maturation takes about nine to 12 months after injury. The scar undergoes changes in color, texture, and consistency during this time. We don’t recommend a surgical scar revision until nine to 12 months after injury. We offer many scar care options including silicone gel, sunscreen, and laser treatments to optimize healing during this time. 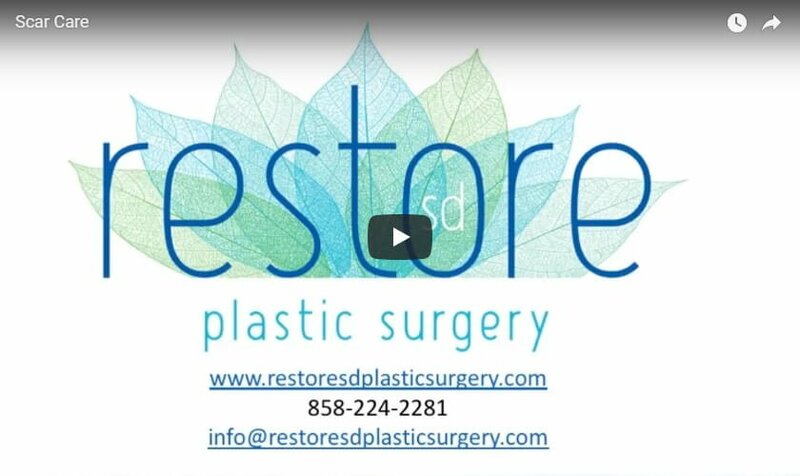 If you have a scar that you’d like to improve, please come see us at Restore SD Plastic Surgery for a consultation. Pre-Juvenation – What is the Best Time to Start Anti-Aging Treatments? How Can I Benefit from a Facelift? Share Your Pet & Get 20% OFF!